We report a case of multiple mobile intra-cardiac thrombi accompanying recurrent pulmonary embolism that has been successfully treated by fibrinolytic therapy. Control transesophageal echocardiographic examination showed that prolonged thrombolytic treatment completely removed the thrombi. Surgical removal of emboli has been validated but cannot be proposed to all patients since it is a high-risk intervention. Fibrinolysis is generally efficient but exposes the patient to risk of migration of the intra-cavity thrombus, with occasionally deleterious evolution. Systemic thrombolytic therapy is usually recommended if (a) it is not contraindicated and (b) the thrombi are demonstrated in more than one cardiac chamber, entailing a higher risk of surgical intervention. However, the infusion rate and duration of thrombolytic therapy are important determinants of successful and uncomplicated lysis. Low dose and long infusion time should be chosen to avoid fragmentation of the thrombus and related complications. A 56-year-old man was admitted to our hospital with chest pain and severe dyspnea at rest. Expiratory ronchus and S4 gallop were apparent on physical examination. The patient's systolic/diastolic blood pressures and heart rate were 160/100 mmHg and 110 beats/min respectively. Precordial T wave inversion and sinus tachycardia were seen on electrocardiography. Transthoracic echocardiography (TTE) showed multiple floating thrombi in the right ventricle (3 × 1 × 1 cm) and right atrium (5.5 × 1 × 1 cm). The patient was diagnosed as recurrent pulmonary embolism on the basis of his history. Initial treatment comprised nasal oxygen 6 L/min, heparin 5000 U IV bolus followed by 1000 U/h infusions, diltiazem 25 mg IV (10 min intervals, three times) and aspirin 300 mg/day. The arterial blood gas analysis was; PO2: 113 mmHg and PCO2: 37 mmHg. Clinical complaints were relieved after 4 h of the initial treatment. The patient was consulted by cardiovascular surgeons for surgical removal of the thrombus. However, it was thought that TTE might not screen adequately for additional cardiac thrombi. Urgent transesophageal echocardiography (TEE) was planned to evaluate the other cardiac chambers for intracardiac thrombi before surgery; at that time the patient's hemodynamic status and physical examination were normal. The patient was pre-treated with midozolam 1 mg/IV and metoclopromide 20 mg/IV. The TEE probe was tolerated very well and swelled non-traumatically at the first approach. The total duration of the procedure was 4 min. 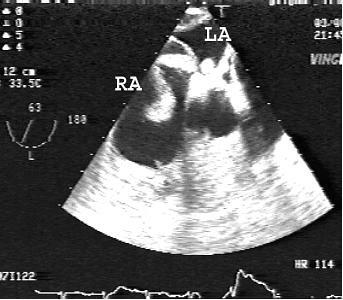 The TEE demonstrated cylinder-like, mobile echogenic massed in right atrium (6.5 × 1 × 1.2 cm), right ventricle (4 × 1 × 1 cm) and left atrium (3 × 1 × 1 cm) (Figure 1). There were no signs of systemic arterial embolism. Surgical options were considered but could not be proposed to the patient since it was not considered feasible to remove all the cardiac thrombi that were apparent from the TEE examination. Intravenous infusion of low doses of streptokinase (250,000 U bolus followed by 100,000 U/hour) resulted in complication-free resolution. The right atrial and ventricular mass disappeared from the control transthoracic echocardiogram after 60 h. No recurrent pulmonary embolism was induced by the fibrinolysis. The TEE examination was repeated after 96 h and showed no cardiac mass (Figure 2). The response to treatment was based on the diagnosis of thrombus. The patient's clinical complaints were relieved during the thrombolytic therapy. Heparin treatment was continued after the fibrinolytic treatment. The continuation therapy consisted of subcutaneous deltaparin injections 120 U/kg twice daily, aspirin 300 mg/day, clopidogrel 75 mg/day and famotidin 40 mg/day. The patient had minor bleeding from vein puncture sites but no major hemorrhage. 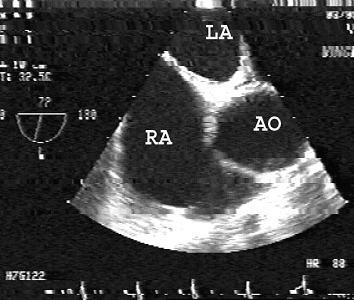 Transesophageal echocardiography demonstrating floating, mobile echogenic mass in right atrium, right ventriculum and left atrium. No cardiac thrombus was seen after successful thrombolytic infusion. Rheumatological and oncological examination and laboratory tests were normal. Thoracic, abdominal and pelvic spiral contrast computerized tomographies were normal except accessory spleen. Total blood count, peripheral blood smear and erythrocyte sedimentation rate were normal. No factor 5 Leiden mutation (G 1691 A) was detected. Protein C and protein S levels were depressed but antithrombin-3 was normal (6%, 16% and 111%; respectively). Anti-cardiolipin antibody was normal (9 IU/ml). HLA-B5, HLA-B27, anti-nuclear antibody and rheumatoid factor were negative. Ophthalmological examination showed no significant finding. Cardiac thrombus may be a complication of primary cardiac, hematological and rheumatological disease . Cardiac-sourced thromboembolism can be predicted on the basis of echocardiographic, clinical, electrocardiographic and laboratory assessments, such as the presence of spontaneous echocontrast, large hypokinetic cardiac chambers, mitral stenosis, history of thromboemboli, atrial fibrillation and increased coagulation markers. In our case, no cardiac pathology tending to thromboembolism was found. The most likely cause for thrombus formation was the decreased protein C and S.
Protein C is the central component of a major antithrombotic regulatory system with both anticoagulant and profibrinolytic properties. It inactivates factors Va and VIIIa. Protein S is as a cofactor for these actions of Protein C. Protein C and Protein S deficiencies are genetic traits predisposing to the formation of venous clots. Protein C deficiency is one of several hereditary abnormalities of haemostatic proteins that have been described in patients with propensities to thromboembolic complications. Major morbidity is often seen in these patients. The diagnosis of various aspects of hereditary protein C deficiency in terms of clinical presentation and genetics (both homozygous and heterozygous states) is important. In heterozygotes, plasma levels of protein C are usually 35–65% normal, whereas most normal individuals have levels between 70% and 130%. Protein C-deficient patients usually develop venous thrombotic complications between the ages of 15 and 40 years with a high incidence of deep venous thrombosis and pulmonary embolism . In addition to the deep veins of the lower extremities, thrombosis can also occur in the cerebral, retinal, mesenteric and renal veins and the inferior vena cava. Most thrombotic lesions appear to develop spontaneously; others are associated with trauma, surgery or pregnancy. Acquired Protein C and S deficiencies have been reported in patients with deep venous thrombosis, pulmonary embolism, acute disseminated intravascular coagulopathy, post-operative state, severe liver disease, malignancy, infection, hemolytic-uremic syndrome, adult respiratory distress syndrome and vitamin K deficiency. Treatment of symptomatic patients is initial heparin therapy followed by coumarin. After multiple thrombotic events, lifelong oral anticoagulant therapy is necessary. Homozygous protein C deficiency, a rare but fatal hereditary condition, manifests itself in the newborn with massive disseminated intravascular coagulopathy and purpura fulminans . Symptomatic presentation in right side cardiac thrombus is fragmentation of the thrombus and subsequent pulmonary embolization . The spontaneous prognosis of pulmonary embolism associated with mobile intra-cardiac thrombus is poor, and choice of a therapeutic strategy is often difficult [5, 6]. The literature on treatment and therapeutic management of mobile right heart thrombus with pulmonary embolism gives no clear consensus. Treatment should be individualized according to the extent of intra-cardiac thrombus (number and sizes of clots and their mobility and morphology), likelihood of pre-existing pulmonary embolism, the patient's cardiopulmonary reserve, co-morbid conditions, and local expertise with treatment modalities . Thrombectomy might have been incomplete in view of the TEE findings. The outcome of untreated mobile thrombus is poor. Surgical removal should be considered for large thrombi. In the event of mobile multiple intra-cardiac thrombi, surgery might not be a good choice for their complete removal. In these conditions, thrombolytic therapy might be preferable . Fibrinolysis is generally efficient but exposes the patient to the risk of migration of the thrombus. Intravenous fibrinolytic treatment for multiple intracardiac mobile thrombi should be given in low doses and for long times to avoid subsequent migration of the intra-cardiac thrombus. Indeed, treatment with high doses of intravenous fibrinolytics for short times may complicate with degradation of the thrombus and facilitate migration before lysis is complete. The major advantages of thrombolysis are ease of administration and independence of patient's hemodynamic status . Over the past two decades, new thrombolytic agents with sufficient pharmacological potency and acceptable clinical safety profiles have been evaluated for treating thrombotic vascular occlusive syndromes such as pulmonary embolism and deep vein thrombosis . Therapy with thrombolytic agents for multiple cardiac floating thrombi is a non-invasive and effective option. In this paper, we have reported a case of recurrent pulmonary embolism with mobile multiple intra-cardiac thrombi, in which the disappearance of the thrombi following successful thrombolytic therapy was documented by TEE examination. Protein C and S deficiencies should be investigated in all patients with cardiac-sourced thromboembolism. Analysis of protein C and S activities are important to avoid underdiagnosis of this pathology. Several therapeutic approaches are possible in patients with cardiac thrombi. Surgical removal of the embolus has been validated but cannot be proposed to all patients since it is a high-risk intervention. Fibrinolysis is generally efficient but exposes the patient to the risk of migration of the intra-cavity thrombus, with occasionally deleterious evolution [11, 12]. Heparin treatment alone has been proposed as an alternative when the other two techniques are contraindicated. If there is no contraindication for systemic thrombolytic therapy and thrombi are demonstrated in multiple cardiac chambers, entailing a higher risk of surgical intervention, thrombolytic therapy is generally recommended. However, the duration and infusion rate are important determinants of successful and uncomplicated lysis. Low dose and long time infusion should be chosen to avoid fragmentation of thrombi and related complications. Assessment in a randomized study is required to define the appropriate therapeutic strategy. TTE may be a limited test for complete screening of cardiac thrombi but TEE is the gold standard for identifying thrombi. It may be feasible to use it for complete evaluation of the cardiac mass and to obtain an accurate diagnosis [13, 14].